Distance from the Liberty Stadium: 311 miles ~ 5 hours. Swans fans are in the east corner of the South stand. The leg room is OK and the view from the away stand is superb but the concourse behind the stand is narrow and gets crowded at half time and before kick-off. There’s a betting outlet and TV screens, showing Sky Sports (and the match once it starts). There’s a fair choice of food on offer with pies, hot dogs, burgers, pizza, chips & curry sauce and a ‘pie and a pint’ deal. Something different is the ‘Parmo in a bun’; chicken in breadcrumbs, creamy sauce and cheese. At the back of the stand, John Smiths, Fosters and Strongbow is sold. 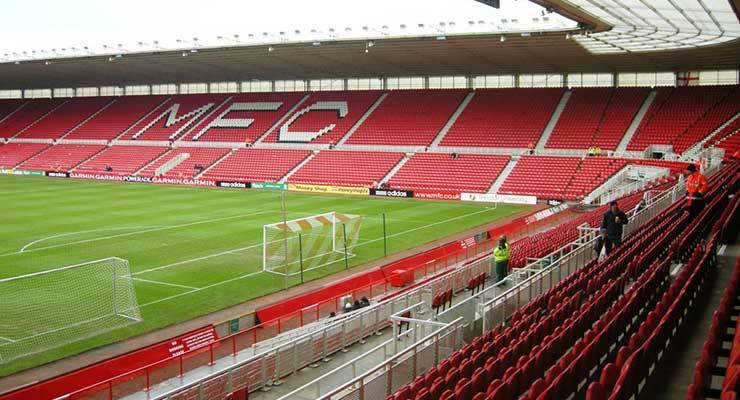 Middlesbrough is the longest trip of the 2018/19 season, so make the most of it and the surrounding area has a lot to offer. From the iconic Angel of the North to Lindisfarne Island, castles, museums and art galleries, there’s a lot to do in the area. There’s loads of nightlife on offer in Middlesbrough, and especially Newcastle with bars, restaurants and clubs. For the more adventurous, there’s mountain biking, walking, canoeing and hiking. If you are staying in Middlesbrough, then Jurys Inn (TS1 1JH), Premier Inn (TS1 1JH) and Holiday Inn Express (TS1 2PA) are 1.4 miles away respectively from the stadium. In the town centre there are other hotels including a Travelodge (TS1 5JF) 2.2 miles away and Abingdon Guest House (TS1 2DP) 1.4 miles away. On the Friday it’s Jazz night at the Middlesbrough Theatre (TS5 6SA), with The Ronnie Scott’s All Stars, tickets are £22.50, on the Saturday it’s Totally Tina, a Tina Turner tribute act with tickets at £20.50. Ongoing exhibitions at Captain Cook Birthplace Museum (TS7 8AT) to commemorate the 250th anniversary of Cook’s famous voyages to the Pacific. Entry is £4 and £2.50 for concessions. One of Middlesbrough’s most famous sons is celebrated with a statue in his honour at Albert Park on Linthorpe Road (TS1 3LB). During 2008 a fatigue fracture was discovered in the statue’s right leg, which mirrored the ligament injury which ended Clough’s playing career; the statue has since been repaired. There’s little in the way of pubs or eating places nearby, so you need to head into the town centre. Doctor Browns (TS1 2RR) is a 10-minute walk and 1.1 miles from the ground at the bottom of Corporation Road, in the town centre. It serves real ale, has Sky TV and a good mix of home and away fans. On the corner opposite the pub, is a sandwich bar, which also sells trays of roast potatoes and gravy. The Bridge Inn is now the modernised Hit the Bar (TS2 1NW) and is next door to the train station, 0.8 miles away. The town centre has five micro pubs close to one another; they are the Infant Hercules (TS1 2LS) and 1.6 miles away, Sherlocks (TS1 2LH), The Slaters Pick and The Twisted Lip (both at TS1 2LF) and all three are 1.5 miles away, and the Devil’s Advocate (TS1 3AA) at 1.4 miles away. There is limited parking at the stadium (car park E) at £6; spaces can be booked through the ticket office. There are a few private car parks nearby, mostly on waste land. Also, when you reach the turn off the A66 (as signposted) for the stadium, instead of turning left at the slip road, turn right to go back across the A66 and there’s plenty of street parking around here, it’s then 20 minute walking to the stadium. You can also choose from a selection of private car parking spaces near The Den – including on-street parking, off-street car parks and a small number of reservable parking spaces from just £3.50 per day. The ground is 1.1 miles and walkable from the train station on Albert Road. Trains leave Swansea at 03:59, 05:29 and 06:47 for the mammoth journey of 8 hours, with no trains back after the game!